With workplace environments increasingly becoming stressful, incompatible and unhealthy for the working populace which lead to various disasters and accidents, it is imperative that industries around the world follow and implement suitable and highly efficient safety system to save lives and properties.Occupational safety is a booming career option for aspiring youngsters and professionals who can set their sight high on career map. There are several options available these days to boost their career in HSE domain. Similarly, institutions offering industry-oriented safety and health courses are also on the rise providing students and working people with several high-profile job options. As one of the most widely accepted and accredited educators and advisors on occupational safety and health, Green World Group has been imparting training through its world-wide network of educational centres to thousands of aspirants for the last several years.Offering indigenously designed, government-recognized and also international boards accredited courses, some of the highly rated courses on offer at Green World Group are IOSH, NEBOSH, HABC, RoSPA, Lead Auditor courses and government of India recognized national diploma courses. 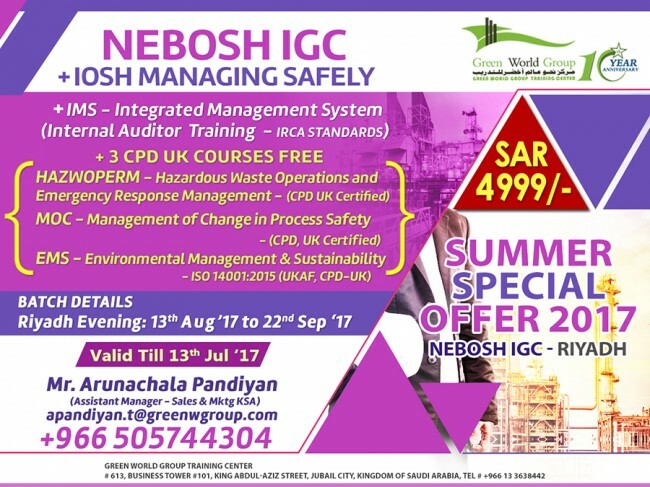 NEBOSH IGC + IOSH MS + 3CPD UK COURSES FREE!!! After enlightening several aspiring students and workers across the globe, GWG has now opened its new training centre in the capital city of Riyadh. Ideally located amongst heavily industrialized part of the Saudi Arabia, the centre offers workplace safety management and skill training to workers and aspiring professionals by experienced tutors. Other advantages of studying at Green World Group in Riyadh is that students can experience state-of-the-art training environment, quality tutors who update students on the latest technology and safety standards and researched and regulated course materials to make them competitive and successful HSE managers. As an inaugural offer, the Riyadh centre of GWG introduces an attractive bundle for students to realize their dream. NEBOSH course in Riyadh is well suitable for candidate those who are studying,working professionals,HSE managers etc Candidates, who chose the effervescent NEBOSH IGC course, will additionally get two years master diploma in occupational health, safety, environment and risk management and ROSPA (UK) accredited courses on first aid awareness, fire safety and accident investigation courses. The once in life time opportunity costs just SAR 4999/. To encourage and facilitate workers and students in Riyadh to take up career in occupational safety and health, the course has been offered during the weekends from April 29 to July 08, 2016.